Submerged forest, Borth – receding wave. Submerged forest, Borth – incoming wave. A few weeks ago I wrote about the submerged forest which had been exposed by January storms between Borth and Ynyslas – see this post. Since then I’ve been back several times in different conditions, with mixed results. 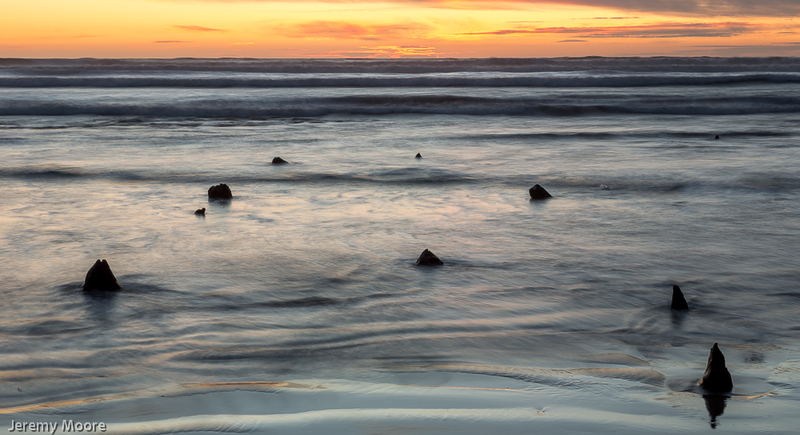 I’ve been plagued by camera shake problems using a ten-stop ND filter. On one visit, during the middle of the day, I came away with virtually no useable images at all, even with exposures of just a few seconds. I decided to forget about the filter and rely on natural light (or the lack of it) to create the conditions I was looking for. My intention had anyway been to capture waves moving through the tree stumps at sunset. Until the sun dropped below the horizon light levels were still too high, but after sunset conditions became almost perfect. On a recent visit I eventually found a photogenic-looking arrangement of stumps, set the camera on the tripod and waited. For a period of just a few minutes the incoming tide washed in and out through the stumps before covering them completely. Sunset colours in the western sky formed the backdrop. Having found “the moment” it was actually quite easy to make the images. I chatted to a fellow photographer, breaking off to press the shutter button every now and again as waves came in and receded! I returned home with dozens of almost identical images to wade through, however, and so far I’ve only processed a few of them. It hadn’t been a particularly intense sunset so I’ve processed them quite hard to give them a little more impact. I’m quite pleased with the results. The beach seems to be returning to normal slowly but steadily. The upper part of the very distinctive tree stump pictured in my first post is still visible but sand is building up around it. There’s no sign of the rather remarkable peat cutting shown in the second picture, which must have been filled in with sand. Perhaps within a few months there will be no sign at all of what the winter storms of 2014 left behind. 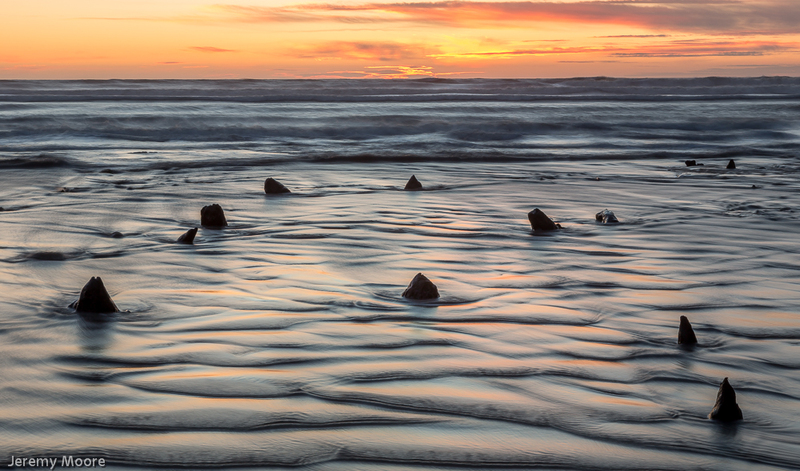 This entry was posted in Uncategorized and tagged Borth, submerged forest. Bookmark the permalink. 2 Responses to More from the submerged forest. Particularly liked the outgoing wave ~ looks like the fins of a shoal of huge sand sharks, (whatever they might be!). Found similar tripod shake trying to shoot stars standing on sandy soil, I guess with the water disturbing the sand it pulls the carpet from under your tripod’s feet, as it were. Worth trying with all the tripod feet on something broad, flat and heavy, if you still want to use the 10 stop? Or even each individual foot on a tray with a small hole to hold the foot in place. Good solution anyway …… works fine. Interesting how the sand has returned. Where did it all go, I wonder? I agree that setting a camera up on sand is not likely to produce a particularly stable base. However I also had the same problem on peat which is fairly solid. Another possible problem is the wind. I could feel it humming through the tripod legs on one visit. A shorter focal length lens certainly seemed to help. I did some reasonably long exposure shots (2-3 secs) the other day with the tripod on rock, and there was definitely a better keeper rate. But with the tide coming in or going out quickly over a flat beach one will be moving one’s set-up every few minutes and a semi-permanent solution would unfortunately not be possible. Just a thought…..I’m thinking of heading over Snettisham way end March / beginning April (big tides). Would you be interested? If not I might be able to call anyway.